I get alot of questions from folks who want to improve their garden soil with compost, but aren’t sure which kind of composter to buy. Traditionally, compost was made in a heap or a chickenwire cage, but now you can find molded plastic models that keep pests away. Some have drawers for easy access to finished compost. The newer rotating models help speed up the process because turning your compost is so easy; some you can even roll around the yard like a beach ball! 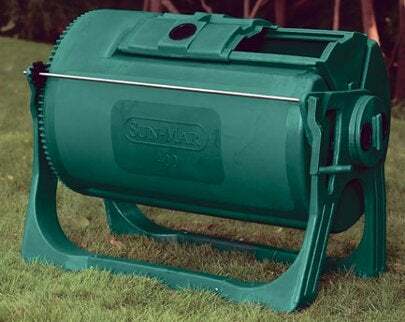 Set up your composter where it’ll get plenty of heat from the sun, and within range of your garden hose. Layer yard waste with kitchen waste, and sprinkle it with water if it gets a little dry, but you don’t want it too wet. Composting is not the same as rotting, and it shouldn’t smell bad. Turn it each time you add to it to keep things processing evenly. Don’t put away the composter once summer’s over; you can keep composting all year round! Thank You For Entering Bob Vila's $3,000 Home Decor Giveaway!